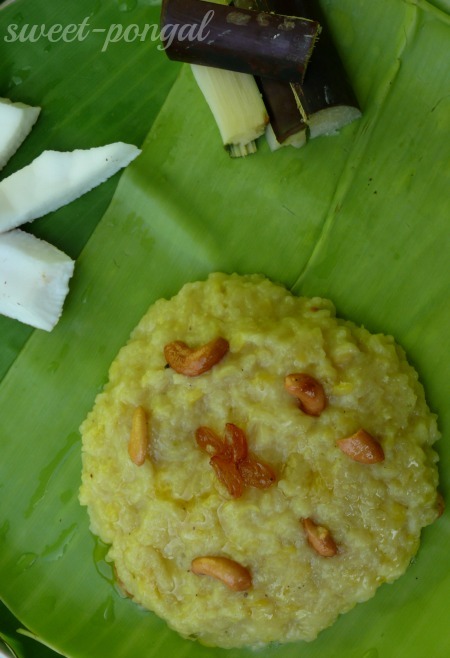 I like this sweet pongal recipe/sakkarai pongal because generally am obsessed towards sweets very much. From this you will understand am having big big sweet-tooth yes, what to do. Pongal is a thanks giving festival where it is celebrated for four days altogether , it is a known piece of information for all ‘Tamilians’ , it is referred to as‘ uttrayana’ as sun travels from south to north. I usually do this pongal in cooker( before four years),but now I do it in thick brass vessel which is meant only for cooking pongal for puja.During olden days they used to cook it in earthen pot which is the most authentic way of cooking .I too have an idea of cooking pongal in a earthen pot in near future. I have shown this cooking procedure using brass vessel.In our houses we celebrate this during the proper pongal day which is called ‘surya pongal’ and people who are having field and cattle celebrate on ‘ulavarthirunal’. Usually when doing sweet pongal recipe they use to roast dhal and even the rice for this ,but I prefer to soak both and boil as such.We can use 2:2 ratio of water milk combination or 3:1 ratio according to our wish.There are many methods of cooking pongal some don’t add milk and some boil rice in milk etc.I don’t add paccha karpooram(edible camphor)because in my family they don’t like it.when milk with rice boils over the pot it considered as a symbol of prosperity in each household.We must add milk after we cook the rice to desirable consistency otherwise chances are there for the curdling of milk. Keep the vessel on the stove add water and let it boil. Then add washed and soaked dhal and rice to boiling water. when rice is cooked add jaggery syrup and mix well otherwise it will stick to the bottom. Then add fried cashew,raisins along with ghee. Add cardamon powder mix and switch off the stove. We can increase the amount of milk in place of water for extra richness. Cardamon powder is added at last to bring out the maximum flavor. Your recipes are clearly demonstrated and I expect more recipes from you. Simple recipe ! Usefull ! 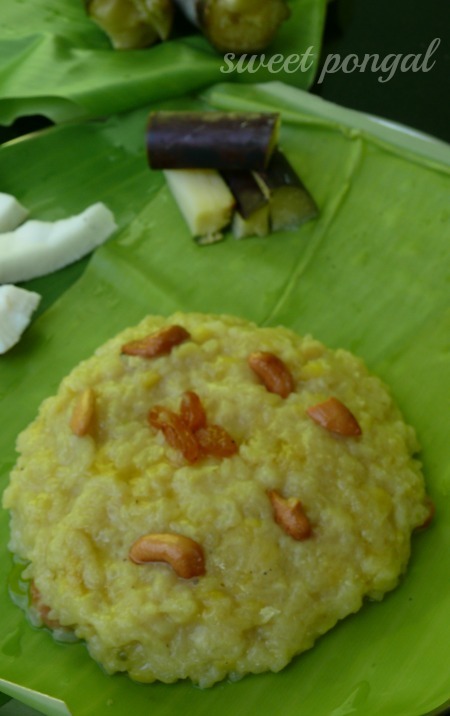 Very tempting sweet pongal. Yummy yummy. I would love to try.